I’ve been running for several years now but I remember those days of being a running newbie. I didn’t know the lingo, it felt uncomfortable and I just knew I looked ridiculous. I learned a lot and have some advice to share! Here are five new runner tips. I started running in Spring 2011. It started innocently enough. I had been going to the gym and walking on the treadmill and one day I figured I’d speed up a little bit and see how it felt. The first time I ran I could only run at 4.5 mph for about a minute. I felt like I was going to die. I felt like every inch of my body was jiggling. I was certain the people behind me were staring at me. It was so uncomfortable. But I was determined to keep at it. I had a not-very-smart smartphone back then that would not run any apps so I kept track of my times and distances the old fashioned way—by typing it in on my phone’s notebook. I recently plugged that old phone in and saw the time from the first few time I ran a 5K. It took me a little over 47 minutes. Eventually I signed up for a race and then another, and another, and another. By the end of 2011 I had completed four 5K races and was getting faster with each race. I’m still slow to some, but I’m much faster than my starting pace of almost 16 minutes per mile. At the present time I have ran 12 5Ks and two half marathons. I’ve come a long way in three years! 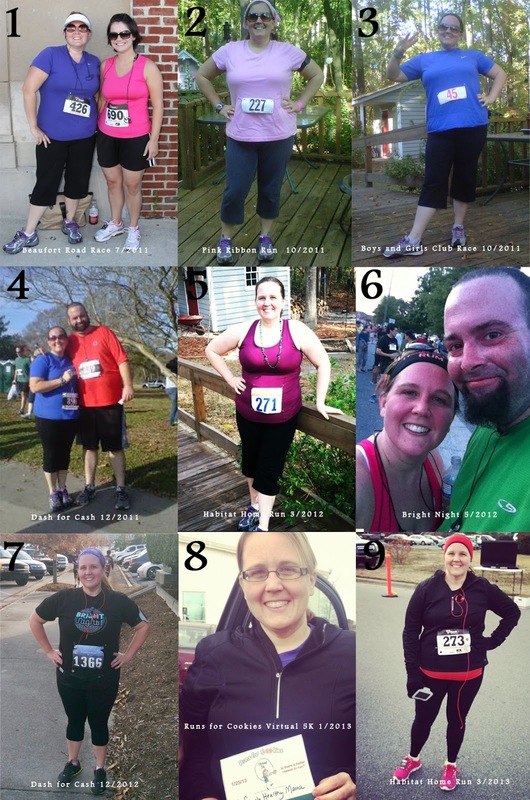 A collage of photos from my first nine 5Ks. I have a lot of people tell me that they wish they could run. Here’s the thing: everyone can run. Now I know there are exceptions. Bad knees, joints, ankles, etc. can cause issues when it comes to running. But don’t ever let your weight or your size keep you from running if it is something you really want to do. Is it going to be uncomfortable? Maybe. But you may discover that you enjoy it and you’ll wonder why you didn’t start sooner. If you are completely new to running you may be confused by running articles that talk about minimalist shoes, pacing, interval training, and track workouts. But honestly, running doesn’t have to be that complicated. It’s simply putting one foot in front of the other. I’m no expert and some days I still consider myself a newbie but I wanted to share a few tips that will help you get started. 1. Get some good, proper fitting shoes. This is not the time to skimp on shoes. I’m not saying you have to spend hundreds of dollars on shoes but you’re not going to want to run around in your Chuck Taylors. A good running shoe will generally cost you between around $100. I love my Brooks Pure Flows but I have also had good luck with Reeboks that I bought on sale at Kohl’s for less than $60. I have never been “officially” fit for a running shoe. I was too embarrassed when I first started running to run on a treadmill in the middle of a store so I just went with what I thought would work. I’ve figured out over time what shoes work best for my feet. If you’re like me and you don’t want to have an official fitting then at the least you should read this article, How to Choose a Running Shoe, or do some internet research for more information on choosing the right shoe for your feet. You’re probably not going to step out the door the first day and run a mile at a 9 minute pace. You might have to walk 5 minutes for every 1 minute you run. You may only be able to run for 30 seconds. But the next day, can you run for 40 seconds? It’s all about improving from day to day and from week to week. The thing about running is you are not competing against anyone but yourself. Check out a training program such as Couch to 5K or Hal Higdon if you want more guidance in improving your time and endurance. 3. Sign up for a race. There are always races to be run. The 5K (3.1 miles) is a very popular distance and is a great distance to begin with. Don’t worry that you’ll come in last. Make your first goal to finish the race. Don’t pay any attention to your time. Just get out there and do it. Be sure to check out my how-to guide for running your first race. 4. Wear the right clothes. You don’t have to spend a fortune but you will be more comfortable if you invest in some running attire. Women—find a good supportive bra. It is going to cost you a small chunk of change ($40-60 for a good one) but after shoes it is the best running gear investment you can make. If you are well endowed check out Enell and Moving Comfort. They both cater to large busted women. I love Moving Comfort bras–they changed my life! Check out Ebay and 6pm.com to find some good deals. Get some moisture-wicking clothing. This is not a necessity but it makes running (especially in hotter weather) more comfortable. You can find moisture wicking clothing at Target, Old Navy, Kohl’s and Walmart for good prices. My favorite for athletic clothing is Old Navy and Kohl’s. Rest days are important. Listen to your body and take a break if you needed. I have had weeks where my body has told me that it didn’t want to run. Mentally I needed a break. Physically I needed a break. Once I started to miss it, I knew it was time to get back to it. Above all, remember that running is suppose to be fun! I know, I know. That sounds completely crazy. I used to think the same thing. Now I truly enjoy it. Running with my hubby or my kids is something I look forward to. Are you a runner? If so, what are your tips for newbies? I defeinitly tried to run too fast when I first started running. I am only up to about a mile running, but I really want to run a 5K in the *near* future. Definitely sign up for a 5K! Finishing a race is such an accomplishment and it is so motivating! Thanks for commenting! I am signed up to run my first 5K in a few weeks. I am curious about what pants/capri’s u like? I have a few pairs and none seem to stay up while I run. I have tried going down in size but doesn’t seem to help…I feel silly pulling my pants up constantly. Also is there a way to subscribe to your blog via email? I usually use FB book or email to follow blogs I love…and I am loving your blog! I responded via e-mail but just in case anyone else is also wondering…I love Old Navy’s compression capri pants. I have two pairs of them and they both have held up very well despite multiple washes each week. Thanks Erin for the comment!